I absolutely LOVE board games, card games and dice games too! They always seem to bring out the camaraderie and conversation between people. Growing up, my mother and I had some great conversations over a game of gin rummy, and my father and I were the same way while playing dominoes. This is why I was really excited to review Hurry Up! The Dice Game from RandomLine. 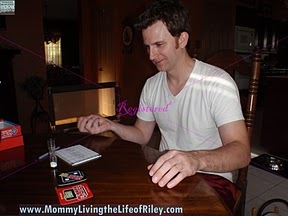 Read more below to see what happened when my husband, Michael, and I played this game. I reviewed Hurry Up! The Dice Game from RandomLine, which retails for $8.00. 2nd Chance Card: There is one 2nd Chance Card that a player can earn . . . if they're lucky! A challenge has to be completed on the very first role of any challenge to earn this card. It will come in handy when a player fails a difficult challenge later in the game, because they will have a 2nd chance to complete it. 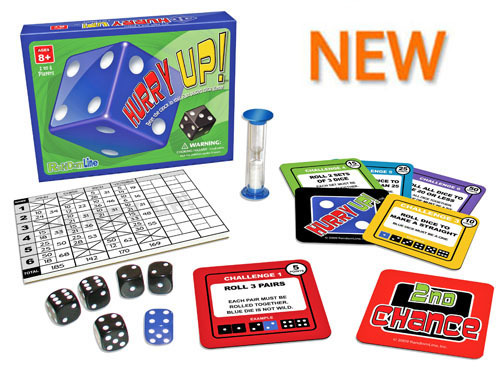 Hurry Up is a fun dice game you can play just about anywhere. Since my daughter is only 20 months old, and Hurry Up! The Dice Game is recommended for children 8 and up, I thought this would be a perfect game for Michael and I to play while Riley was napping. The rules were very simple and within minutes Michael and I were knee-deep in some fast and furious dice action! Basically, the game is like Yahtzee in a way because you do take score and you are trying to roll certain dice combinations in order to score those points. But, unlike Yahtzee, you can roll the dice as many times as you'd like WITHIN 30 SECONDS! Here's where the fast and furious comes in! Also, this game really helps instill math skills in your children in a fun way. When the clock is ticking and you have to figure out whether your particular combination is less than 25 or not, for example, your brain is going crazy trying to add so fast! The only criticism I have of this game is that the last two challenges are ridiculously hard to accomplish. Both Michael and I took zeros on these challenges and frankly, we didn't even come to close to getting them right. I wish that they would have been a tad easier. When you only have six challenges and two of them are next to impossible, then it kind of takes the wind out of your sails a bit. I really like this game and can see playing it with Riley when she learns addition. Also, if you wanted to modify this game for children who are learning math, but are not quite adept at it, you could even agree on turning the timer over two times for them (1 minute) or more. Either way, I think that this is a great family game that is a lot of fun to play! Disclosure: I received Hurry Up! 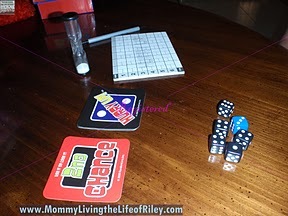 The Dice Game from RandomLine Inc.in order to facilitate my review. No other compensation was received. This product review is based on my own personal experiences with this item and is completely honest and objective.